What you need, is what your business needs too. The amount of time & space I need to be on my own and not talk to other people, fluctuates between a lot and A LOT. Right now, I’m in a phase where I need A LOT of time on my own, and my attention and energy are mainly turned inwards. That’s exactly what I need right now. And I honor that completely. It makes me cranky, tired, drained, and feel like I’m constantly haunted by an invisible pressure that bugs the hell out of me – like an annoying noise you just can’t ignore, no matter what you do. That’s a price I’m not willing to pay anymore. I made a decision years ago to honor my soul’s needs always, and to never compromise or settle, on anything, no matter how small. And I consciously built my entire business and life in a way that allows me to do just that. The most important thing this taught me is that what I need, is what my BUSINESS needs, too. What’s good for me, is what’s good for my BUSINESS, too. I see proof of that again and again. In my own business. And in the businesses of my private clients. Can I REALLY work less and still grow my business? Can I REALLY take a walk followed by a nap followed by reading a novel when my to-do list is a mile long? Can I REALLY give myself endless stretches of alone time without interacting with anyone AND grow my business AND work with people all at the same time? The answer is ‘YES’ – when your needs come from your soul, you WILL get the results you choose while giving yourself exactly what you need. Can I REALLY do this / let go of that / allow myself to have this/…..and STILL make enough money AND even grow my business and impact as well? To do everything EXACTLY how YOU choose to do it. To put YOU first, and build your entire business around it. And to never compromise on ANYTHING your soul or body needs. Your results come from your energy and the inspired actions you take from that energy – NOT from the amount of actions you take. Which means that the better you feel about your business and how you deliver your work, the better the results you will get – and you’ll be happy and feel good, too. The more you resist your business or how you deliver your work, the more you have to push and force yourself, and the worse your results will be and– and you feel crap about everything the whole time for SURE. Stop denying yourself the things that you crave. 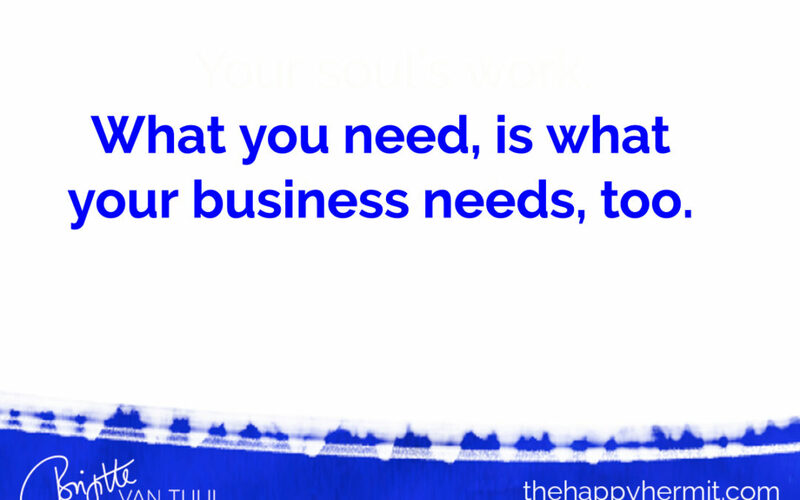 What your soul needs, is what your business needs, too. What’s good for you, is good for business, too. What is it your soul needs? Take a leap of faith (or just a deep breath) and give it to yourself. You’ll feel so much better. And your business AND clients will benefit, too!! P.S.1 : Need help with doing business EXACTLY as you choose, so you can fully express your soul AND get the results & impact you want? My 1-1 coaching may be just what you need. It’s not for everyone. But it might be perfect for you. P.S. 2: And keep an eye out for my brand-new community that starts in April (most likely). That’s ALL about putting YOU first, so you can make a difference & grow your business – without sacrificing, compromising or changing who you are. I’ll share more about the program AND some behind-the-scenes of how I created it with you soon. How I create all of my programs & the questions I ask myself in that process are NOT your typical here’s-how-you-create-a-program-formula. Yes, I definitely use some of the ‘regular’ ways of creating programs as well – but I added some crucial steps/questions that 99,9% of all women entrepreneurs forget about. I’m not sure yet how I’ll share this info that you can use for your own programs & services, too, first name – in a series of emails, or a Facebook live training, or…..something else?